Brighton, MI, is not known as a hotbed of exotic cuisine, so it's a pleasant surprise to find a place like Sushi Zen there. It's a good sushi restaurant, with an innovative take on things, some amazing rolls, decent prices, great staff, and truly outrageous presentations. Most Westerners would assume the "Zen" in the name suggests simplicity and minimalist design — while that's broadly true for the restaurant's decor, it's not at all true for the creative (and sometimes bizarre) ways they plate the food. The sashimi flower above is an example, though it's a relatively small presentation. Below is what you get with the "Standard Sashimi Plate," complete with blue glass vase filled with ornamental greens, shiso leaves, and a plethora of other items, all served on a lazy susan. The sushi itself? Good quality. The fish is respectably fresh, the rolls are good, and some of them are really creative. They've got a bit of Korean influence (they have Korean dishes on the menu too) showing through, with the use of gochujang as one of their hot sauces. They also use some unusual ingredients, like pickled wasabi root, which is basically pickle relish which can blow your head off. That's served as a garnish to salmon roe with a quail egg (see below). We saw it being served to another table, and they gave us a taste of the pickled wasabi. The Amazing roll — the whitish one in both of the photos above — is wrapped in "white tuna" (aka escolar) which has been lightly charred with a blowtorch before serving, giving it a nice smoky flavor. The Samurai roll is a relatively standard construction of tempura shrimp, tuna, avocado, and eel... but with a great set of sauces drizzled over it. If you're ever near Brighton and have a craving for sushi, Sushi Zen is definitely worth a visit. Most sushi restaurants are very similar to each other; this one really stands out. Cherry blossoms bloom in Spring, and Ann Arbor's newest Japanese restuarant is no exception. Cherry Blossom Japanese Restaurant opened two weeks ago in the former Chi Chi's location on State St. past I-94. The owners are not new to the restaurant business. They also run the original Cherry Blossom restaurant in Novi, and this experience shows in both menu and service. The spacious restaurant has been remodeled with beautiful warm tones. Behind the sushi bar, a pair of sutble waterfalls send water sliding down stone walls while the sushi chefs work their art. 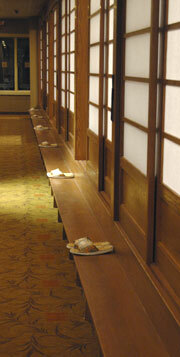 You can choose Western seating, or, if you like, ask about seating in one of the traditional tatami rooms. Just remember to remove your shoes before entering the room. 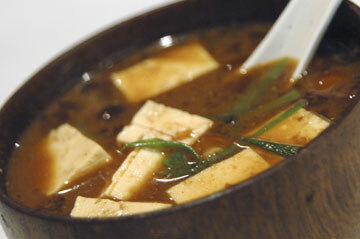 We started our sampling with the tempura appetizer and hiyayakko -- cold boiled tofu. Joe declared the tempura dipping sauce the best he's tasted in a long while. The hiyayakko came with finely sliced scallions and shaved bonito and grated ginger, creating an interesting mix of tastes between the plain tofu, the seafood flavors of the bonito, and the ginger's sharp spiciness. Green Grass Roll and California Roll at Sadako, Ann Arbor. But sometime around the turn of the millenium, an odd thing began to happen: Japanese restaurants began opening everywhere in Ann Arbor. Godaiko and Yamato (my favorite and the best tamago, hands down!) are probably the oldest of this group, but there's also been Wasabi (since closed), Sushi.come, Totoro (in Hinodae's spot), Yotsuba (quite excellent), Makkara, Saica, miscellaneous maki roll places, Korean restaurants serving sushi on the side, and now... Sadako. The interior is tasteful and welcoming contemporary design with soothing blues and a dark wood sushi bar. The restaurant was crowded, but we were able to get seated immediately by being willing to sit at the sushi bar. 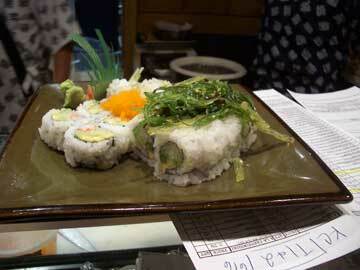 Four sushi chefs worked shoulder-to-shoulder filling dine-in and take-out orders. It was a pleasure to watch them assemble the rolls. The chef working directly in front of us was delighted that we could name the different rolls he was making without looking at the menu. I had the small sashimi plate, which was a pretty arrangement of the usual sushi suspects (maguro, hamachil, white fish, salmon) on a small ceramic "sushi boat". I was slightly bummed that it didn't include any of the more interesting fish kinds, but at $12.99 for 11 pieces (though smallish pieces), it's hard to argue with it for the price. We both ordered tamago, which was nice and not too sweet. Joe ordered a spicy tuna hand roll, inarizushi (the chef took a liking to him and gave him an extra piece), the Sadako roll, and another rather large roll which I'm forgetting. We were both very impressed with the Sadako roll, a very tasty and slightly sweet roll topped with crunchy tempera bits. One of the more beautiful rolls we saw made was the Green Grass Roll, with its topping of seaweed salad, and I snagged a picture of it just as the chef was adding the finishing touches and before a waitress whisked it away. Sadako is a good addition to S. University and definitely worth a trip. Joe loves this dish, and on occasion he convinces me to cook it. I like it too, but it's rather labor intensive and messy. So it's a special dinner when it's Kara Age night. This time I served it with goma ae (spinach with a roasted sesame sauce) and edaname (boiled soybeans — think of them as cooked peanuts) and rice. When I make it, I get a really nice delicate coating. I actually like it better without lemon, which tends to mask the subtle flavor of the coating. Combine marinade ingredients and marinate chicken in a shallow boil for an hour at room temp. (Or up to eight hours refrigerated.) Stir occasionally. Combine dredging ingredients. While you're bringing enough vegetable oil for deep frying to 350 F in a wok (or other suitable frying pan), lift each piece of chicken from the marinade and dredge. Shake off excess flour and set aside. By the time you're done, the first pieces should have turned light brown as the coating absobes the marinade. Fry chicken in batches of 3 to 4 pices for less than a minute at about 350 F. Lift out and drain on paper towel. Lower oil temp to 325 F, and fry chicken pieces a second time in batches of 6 to 7. Drain on paper towel. Serve with lemon wedges. Without a thermometer, I find I usually let it get way too cool then way too hot. but here's a tip for deep frying without a thermometer. At 350 F, a pinch of dredging flour will sizzle immediately on the surface of the oil without burning. At 325 F, a pinch of dredging flour will sink slightly before sizzling. I often start a bit high because the first batch of chicken will make the oil temp drop rapidly.